Arctic scientists examining sea ice and melt ponds in the Chukchi Sea in high north. NASA photo. In the chart below MASIE shows May Arctic ice extent is below average and lower than 2015 at this point in the year. Comparing the first 5 months of the melt season shows why 2016 so far is a so-so melt season, meaning not very good, not very bad; or same old, same old if you prefer. Until May, the two years had the same average extents. Looking into the details, the difference arises from some marginal seas melting earlier than last year, while the central, enduring ice pack is relatively unaffected. In fact, the overall difference between 2016 and 2015 is similar to comparable losses from maximums in a single place: Sea of Okhotsk: To date 1231k km2 of ice lost this year vs. 696k km2 lost in 2015 in that sea at the same date. Region 2015152 2016152 km2 Diff. Of interest this year is the Beaufort Gyre cranking up ten days into May, compacting ice and reducing extent by about 150k km2, and putting the loss there ahead of last year. As Susan Crockford points out (here), this is not melting but ice breaking up and moving. Of course, warmists predict that will result in more melting later on, which remains to be seen. In any case, Beaufort extent is down 23% from its max, which amounts to 5% of losses from all Arctic seas so far. Comparing the Arctic ice extents with their maximums shows the melting is occurring mostly in the marginal seas, as expected in May. It is clear from the above that the bulk of ice losses are coming from Okhotsk, Barents and Bering Seas, along with Baffin Bay-St. Lawrence; all of them are marginal seas that will go down close to zero by September, and only Baffin has more than 15% of its ice left. The entire difference between 2016 and 2015 arises from Okhotsk starting with about 500k km2 more ice this year, and arriving at this date virtually tied with 2015. CPC shows the Arctic Oscillation waffling between positive and negative values, recently negative and forecasted to rise back toward neutral. 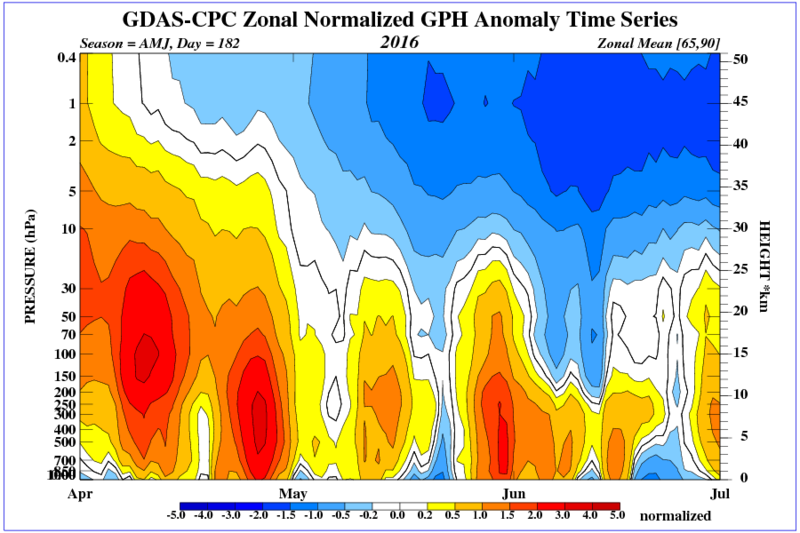 Generally, negative AO signifies higher pressures over Arctic ice, with less cloud, higher insolation and more melting. The outlook at this point is mixed. We are only beginning the melt season, and the resulting minimum will depend upon the vagaries of weather between now and September. At the moment, 2016 was slightly higher than 2015 in March, and is now trending toward a lower May extent. OTOH 2016 melt season is starting without the Blob, with a declining El Nino, and a cold blob in the North Atlantic. The AO hovering around neutral, giving no direction whether cloud cover will reduce the pace of melting or not. A so-so year is like a glass half full or half empty. 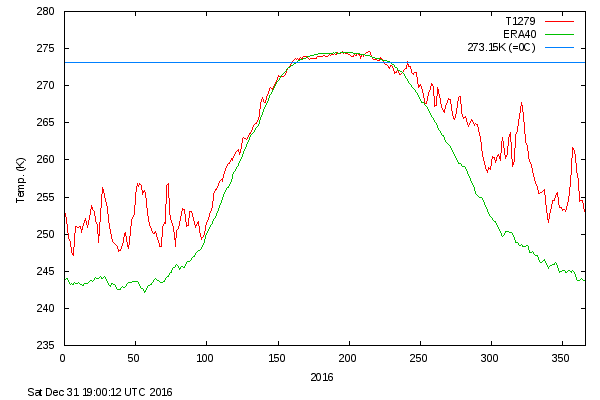 If you are hoping for an Arctic ice decline, 2016 so far is good, but not very. If you want Arctic ice to hold steady, the year is bad, but not very. Temperature on the pole has remained normal. AO will tend negative when grown in the lower stratosphere ionization by GCR and the pressure increases. There will be plenty of rain in Europe. An autocatalytic cycle for ozone production in the lower stratosphere initiated by galactic cosmic rays.